With the guidance of family and friends, learning to cook at an early age can shape the way you cook and eat for years to come. Discover how fun and easy cooking can be, and create delicious food to share with The Junior Chef Cookbook. 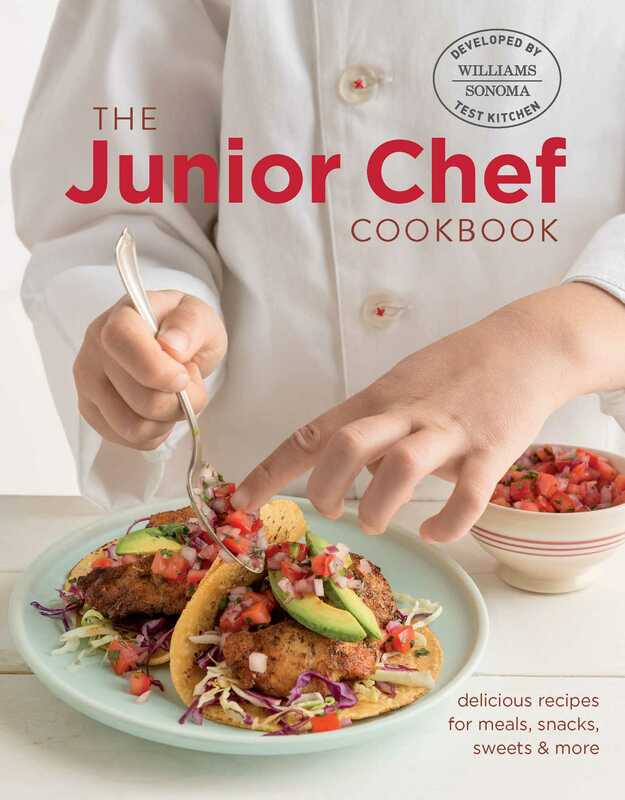 This collection of easy-to-prepare recipes, a companion book to Williams-Sonoma’s popular Junior Chef cooking class series, will inspire kids to have fun in the kitchen while learning to create delicious food. The Junior Chef Cookbook teaches kids how to cook a wide range of dishes made from fresh ingredients. More than 30 tasty recipes for every meal of the day fill the pages of this beautifully photographed book. Recipes include Blueberry-Almond Muffins; Buttermilk Pancakes with Berry Compote; Mini Hawaiian Pizzas; Buttermilk Fried Chicken; Homemade Orecchiette; Baked Chocolate Doughnuts with Chocolate Glaze; No-Churn Vanilla Bean Ice Cream; and more. Place a rack in the lower half of the oven. Place an inverted baking sheet on the rack and preheat to 450°F. In a frying pan over high heat, warm the oil. Carefully add the chicken and cook, stirring occasionally, for about 2 minutes. Reduce the heat to medium, add ½ cup of the barbecue sauce, and simmer until the chicken is cooked through, about 8 minutes. Remove from the heat. Cut 2 sheets of parchment paper the size of a baking sheet and dust with flour. Working directly on the parchment, roll out the pizza dough into 4 rounds, each 10–12 inches in diameter (2 rounds on each parchment sheet). Divide the tomato sauce and the remaining ½ cup barbecue sauce between the pizzas and spread evenly. Top each with the cheese and chicken, dividing evenly. Have an adult help you remove the baking sheet from the oven; it will be very hot. Slide one piece of the parchment with 2 pizzas onto the inverted baking sheet and return it to the oven. Bake until the crust is dry and golden brown and the cheese is bubbly, 8–10 minutes. Carefully remove the pizzas from the oven and let cool for a few minutes, then top with half of the green onion and cilantro. Cut into wedges and serve. Return the baking sheet to the oven to preheat and repeat to bake the other 2 pizzas.